← Bichos Argentinos #14 – Flies! Last month I traveled to Starkville, Mississippi to meet with an academic cooperator at Mississippi State University. While arranging the trip, I contacted Terry Schiefer (no, not the fashion jewelry designer, but curator at the Mississippi Entomological Museum) to let him know I would be visiting. Considering that late May should be pretty good insect collecting in that area, I wanted to see if he might be interested in doing a little beetle collecting after I finished up with my meetings. Terry also specializes in Coleoptera and shares with me an interest in the taxonomy and faunistics of Cerambycidae and Cicindelinae. I first met Terry some 13 years ago during my previous visit to MSU; I remember ogling at an impressive series of Aegomorphus morrisii, a spectacular species of longhorn beetle that was known at that time by precious few specimens and that he had recently found in Mississippi. We hadn’t seen each other since but managed to keep in contact with occasional correspondence during the course of our longhorn studies. 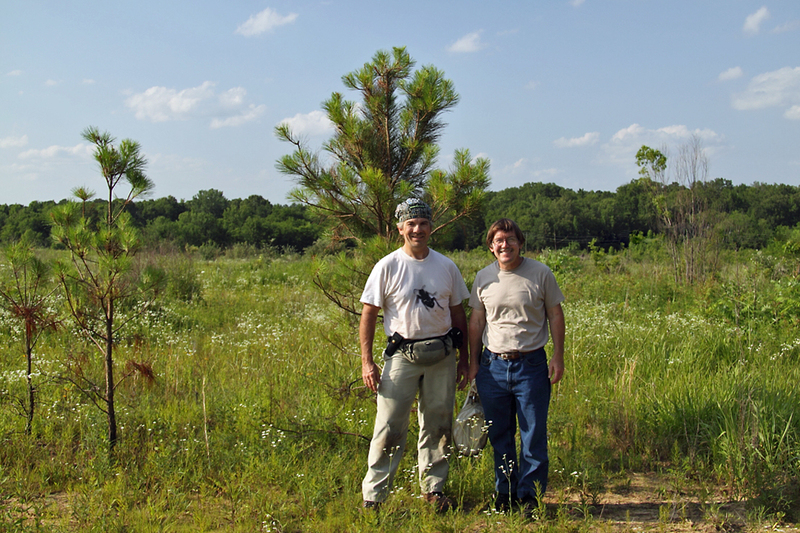 Me & Terry Schiefer | Noxubee National Wildlife Refuge, May 2011. Terry was more than happy to go beetle collecting with me, and among the possibilities that he mentioned when I arrived at the museum was nearby Noxubee National Wildlife Refuge. 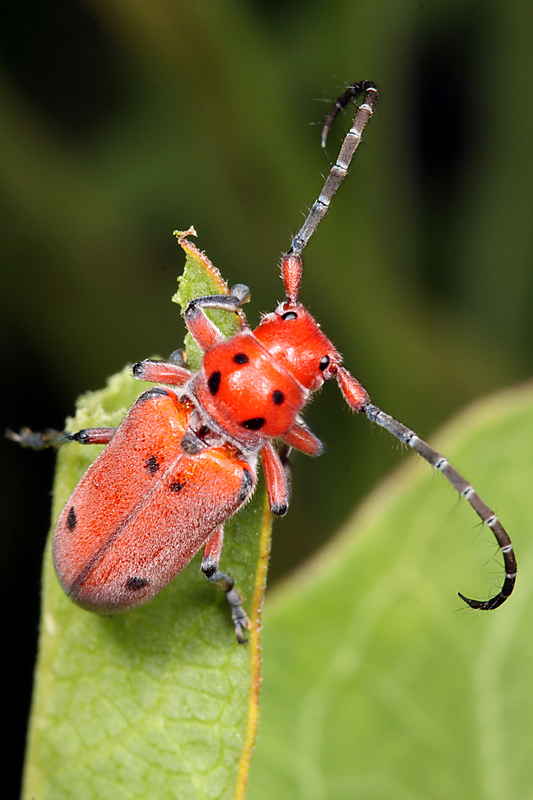 I had done a little collecting there on my last visit, but I was especially intrigued when he mentioned the local population of an uncommon milkweed beetle species, Tetraopes texanus, that he had reported in one of the refuge’s prairie remnants (Schiefer 1998). I have only seen this species once, up here in in east-central Missouri and which I reported as the species’ northernmost known population (MacRae 1994). My more recent attempts to find this species have not been successful, so I was excited at the chance to see this longhorned species once again. I chased beetle after beetle in flight, endlessly zigzagging across the prairie in what had to be a spectacle to any unknown observer. Eventually, we found a beetle sitting on its host plant, and it remained calm during my deliberate approach. I circled around for a good view of the dorsal surface and snapped off an apparent winner—everything in focus, good composition… but arghh, the antennal tips were clipped! I kept at it and was about to back off a bit on the magnification and switch to landscape mode so I could get the full antennae in the frame when the beetle turned in a most fortuitous manner—nicely positioning its distinctive antennal tip right in front of a bright green leaf for contrast. My friends, I present Tetraopes texanus on its presumed host plant, Asclepias viridis! Terry and I were both puzzled by the flighty, nervous behavior that the beetles were exhibiting. 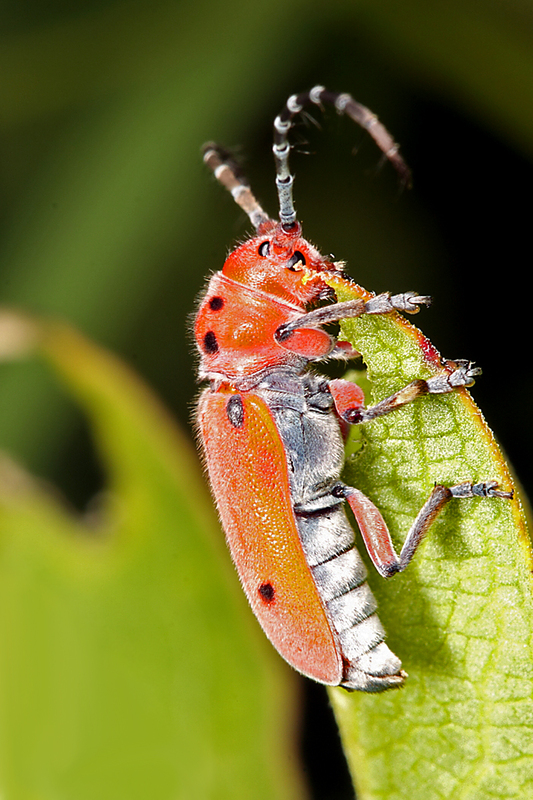 Neither of us had seen such behavior with milkweed beetles before, and I’m not sure I can offer any explanation for such. I’d be interested in hearing any ideas you might have. My thanks to Terry for showing me a few of his favorite spots (allowing me to collect a few choice species of longhorns), and to my co-worker/colleague Jeff Haines for indulging my desire mix a little beetle collecting into the business trip. I hope they enjoyed it as much as I did. MacRae, T.C. 1994. Annotated checklist of the longhorned beetles (Coleoptera: Cerambycidae and Disteniidae) occurring in Missouri. Insecta Mundi 7(4) (1993):223–252. Schiefer, T.L. 1998. Disjunct distribution of Cerambycidae (Coleoptera) in the black belt prairie and Jackson prairie in Mississippi and Alabama. The Coleopterists Bulletin 52(3):278–284. 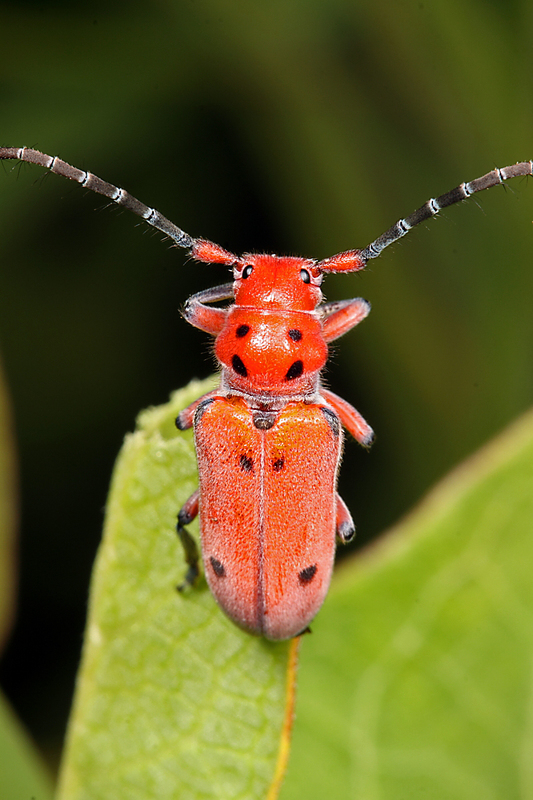 This entry was posted in Cerambycidae, Coleoptera and tagged beetles, entomology, insects, longhorned beetles, Mississippi, nature, predator avoidance, science, warning coloration. Bookmark the permalink. Your persistence payed off. That is a gorgeous beetle! 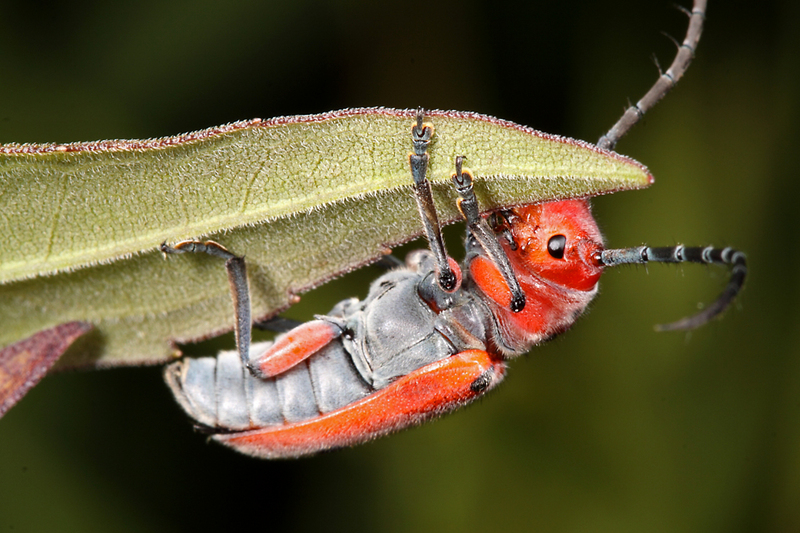 Despite the glycosides, are there any known predators of this beetle? Wheel bugs (Arilus cristatus, Reduviidae) have been reported as primary predators of adult common milkweed beetles, Tetraopes tetraophthalmus (McCauley and Lawson 1986), but I can’t imagine any significant bird or vertebrate predation on species in this genus. Behavior, however, doesn’t lie, and something had them spooked. I recall with pleasure collecting these beetles in the eastern US. As a kid I was intrigued by their squeaks. There is a lovely insect fauna associated with Milkweeds. The common species (T. tetraophthalmus) is so common that we take it for granted, but I think everyone who was a nature-nut kid in the eastern US has fond memories of it. For us grown-up nature nuts, the genus is quite diverse with many rare and localized species – makes for some fun searching across many geographies. I kind of miss them – they are common in the lower peninsula of Michigan where I grew up, but they evidently don’t live up north here in the upper peninsula. I used to like to hold them up to my ear and listen to the “eeee eeeee eeeeee” noise they would make when disturbed. Although, we do still have squeaking beetles up here. Just yesterday, my daughter caught a weevil that was camouflaged as a bird dropping (she called it a “poo beetle”), and it made a loud enough noise that I was able to record it. Strange they’re not up there – they’ve been recorded in Quebec, Ontario and Manitoba (as has T. femoratus). Occurrences must get patchy at the edge of their distribution. Envious of your getting to hang out with the MEM folks. I went on the Cross Expedition with them several years ago, and it was a lot of entomological, anty fun! Terry is the only one that I know, although I met Richard Brown this past visit – very nice guy! There are lots worse places to collect insects than Mississippi. Ted, do you know if Terry Schiefer did his Grad work at PSU ? I knew someone by that same name -and collected beetles with him in the Scotia Barrens (north of Penn State) back in 1985. Lost contact with him since and would love to connect again (still about beetles). Love your pages (and pics) and find myself clicking through them regularly. Tho amateur, my love of beetles has taken me world-wide as well and allowed me to collect with some of the nicest and most adventure-minded people. 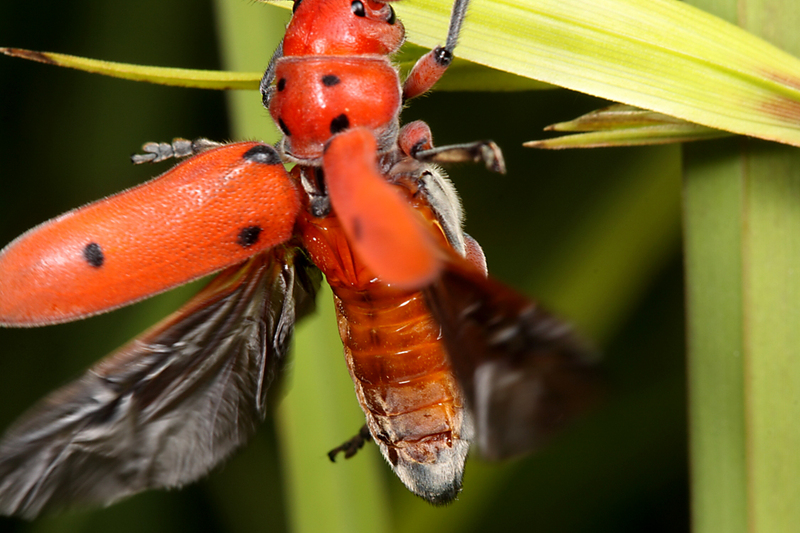 Are you interested in Cameroon beetles, weevils, etc ? I know he grew up in PA, so it could be him. Thanks for visiting and for the nice comment. I don’t know much about the African fauna other than from my own collecting in South Africa some years ago. I just found one in PA. I know this article is old but, I can’t find info on them. Including having previously being seen in my state. Do they bite? Or, are they harmful in any way? PA is well out of range for T. texanus, so I’d need some confirmation that it is that species. There are a number of species in the genus that look quite similar. If you are willing to send the specimen I’d be happy to tar a look at it.